La facturación local nacional creció 5,7% entre enero-agosto 2017 vs 2016 mientras que el sector comercial tuvo una expansión del 8,6% en el mismo periodo. El índice de confianza empresarial se expande desde noviembre del 2016 y el índice de confianza del consumidor crece desde enero del 2017. Los créditos concedidos por parte del sistema financiero ya superan por 16% los niveles pre crisis del 2014. El riesgo país ha bajado 200 pb de su nivel de octubre 2016. El desempleo urbano se ubica en 5,4%. En los últimos 6 meses el déficit global ha sido menor a los promedios históricos del país. Todos son buenas noticias. ¿El país se recuperó? La respuesta es no, o al menos, es complejo. La economía ecuatoriana atravesó una etapa de recuperación, pero está muy lejos de estar estabilizada y a medida que pasan los meses surge evidencia de sobra que apunta a una recuperación débil, sin fundamentos y que probablemente tendrá su recaída. La primera señal de alarma fue el déficit de febrero 2017. En época electoral el Gobierno tuvo el déficit global más alto de la última década. Luego alcanzamos los niveles de subempleo y empleo inadecuado más altos de la década. La economía se enfriaba y la inflación empezó a acercarse peligrosamente al cero hasta que llegó a territorio negativo. A pesar de que el Gobierno de Lenin Moreno logró desmarcarse del correismo y generó altísimos niveles de aceptación e incluso un artículo positivo de “The Economist”, el shock de confianza que generaron sus palabras tuvo escaso eco en acciones. Se anunció que se devolvería el rol de motor de la economía al sector privado, pero del Consejo Consultivo Productivo y Tributario solo salieron medidas recaudatorias para proteger al fisco. Las medidas de austeridad fueron insuficientes y a pesar de que el presupuesto 2017 y 2018 continúa sobreestimando ingresos y subestimando gastos, se presentan déficits por encima de los $4 mil millones. En el Global Competitiveness Index y en el Doing Business, Ecuador descendió posiciones. Chile, Colombia y Perú han hecho la tarea y disfrutan de niveles de inversión extranjera entre 3 y 5 veces superior a Ecuador. En la misma línea, nuestra inversión en maquinaria y equipo se contrajo 25% en el último año y lleva 8 trimestres consecutivos de contracción. La poca esperanza por un cambio en el manejo económico que podía quedar fue sepultada con la ley orgánica para “impulsar” la reactivación económica. Otra vez el Gobierno se pone como el alfa y el omega de la actividad económica. Se prioriza la recaudación y se otorgan preocupantes competencias a las aduanas. Para generar empleo de calidad, se otorgan beneficios tributarios a segmentos empresariales que, aunque generan “mucho” empleo, solo afilian a 1 de cada 4 trabajadores. 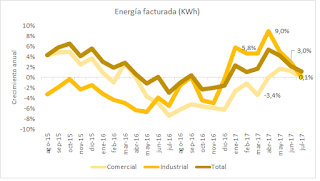 Finalmente, el consumo industrial de energía (medido en KwH) lo resume de forma sencilla. El crecimiento de 9% que se registró en abril y mayo ya se apagó. A julio el crecimiento es 0,1% interanual, y se anticipa que recaiga a zona negativa. Fue solo un breve espejismo. La recuperación que describimos al inicio no tuvo fundamentos sólidos. Pero eso lo sabía el propio Gobierno; ellos denunciaron la mesa "mal servida". Mas allá que reconocer los excesos de la década anterior y buscar mantener el gasto público para generar actividad económica debemos implementar cambios legales para crear un entorno que permita el desarrollo, sin discrecionalidad, sin arbitrariedad, de forma sostenible, etc. Our educational system: more and better education? Two people love drawing. Both use most of their free time engaging in activities related to this passion. They dream about it; both starve for an extra chance to put on some work and create. As time passes by, one goes further and decides to make it his profession: studies techniques at school and university, devotes entirely to the development of the required skills and ends up as a well-known artist. On the other hand, the second puts it aside accommodating his ‘hobby’ between school, his part-time job and taking care of his siblings; he also pursues tertiary education, but chooses a more common career given the concern that being an artist would not provide him enough earnings. When the cause of such contrast proceeds from people facing different contexts, the doubt about how effective is the society in the provision of opportunities arises. This is not an isolated case. It is actually a common situation in less developed countries, where people are used to put aside their passions and opt for a more within-the-box occupation that provides them enough money to survive. On the other hand, achieving tertiary education in environments of lower income is already a too-far-to-get objective: countries as Eritrea and Chad had a gross involvement in tertiary education of only 3% in 2014. In Latin America, the average involvement rate was 45% in the same year. The fact that it is higher than the world’s average of 34% may seem surprising, but there are some methodological issues that may explain the differences. Ecuador’s rate is far below this regional average, with levels of approximately 18% in urban areas and less than 7% in rural areas. To this respect, while lower levels of formal education are not necessarily a determinant of failure in the labour market, on average, it has been proved that education is connected to better jobs and higher income, both being closely related to welfare. Self-selection is conceived as responsible for most of the observed outcome disparities. The nature and impact of such traits has been highly explored, especially in sceneries that go from education to the general use of social programs. But, recalling the initial inquiries: If we had people with similar characteristics and preferences, why would they achieve uneven outcomes depending on the environment? Why the odds of being a successful pilot, dancer, singer or, even worse, attaining any formal profession are different among countries? Those are some of the questions that development economics has been trying to answer for years. Some argue the environment implies a certain level of opportunities, and that most opportunities are related to a person’s experiences and education. Therefore, we get back to where we started. That’s why governments, private initiatives, ONGs and international organisations make huge efforts to provide education access. They have been successful in addressing some of the most serious barriers to access primary, secondary and tertiary education. However, the impact in terms of educational outcomes, and in particular student learning, has been much less impressive. A recent publication by the WB analysed the impact of their programs supporting education in developing countries. It found significant weaknesses in student learning, measured by the change in performance. One of the most relevant examples is Peru, with only 8% of sixth graders reaching mastery levels in language and 7% in maths. A parallel study cites that, even though they were supposed to, “75% of the first graders could not read at all by the end of the school year” (Crouch, et. al., 2005). And more generally, some findings coincide in that children at schools outside the government systems achieve, on average, higher learning outcomes with equal or less resources. Aiming to uncover the reasons behind that, the Public Expenditure Tracking Survey (PETS) reveals how much government funding actually reaches the classroom by identifying the main points of resource leakage. In some cases, it goes even further to evaluate characteristics of service delivery. Among the most enlightening detections, higher government spending on education in Zambia had no effect on outcomes because parents counteracted it by reducing their spending in an equivalent amount. In Peru, the survey offered some insight on the complexities behind the distribution of funds from central government down to classrooms due to excessive bureaucracy. It was also the country with the lowest impact since there were frequent changes of authorities; such instability of institutions undermined ownership of the results and diminished incentives to change policies. Another WB study examines the relationship between individuals’ skills and labour market outcomes for the working-age population in Colombian urban areas. The main source is the Skills toward Employment and Productivity (STEP, 2012) household survey, which focuses on two main categories of personal skills: cognitive, understood as aptitudes to perform mental tasks such as comprehension or reasoning, and socio-emotional, that refer to personality traits and behaviours. The results showed that although both matter for pursuing tertiary education and getting favourable labour market outcomes, their roles differ. Cognitive skills were proved to be greatly associated with higher earnings, job formality or high-qualified occupations, while the second played a stronger role in terms of labour market participation. The statistics related to education attainment and access to scholarships for education in Ecuador during the last decade is remarkable. To begin with, education became free of charge up to the tertiary level, providing potential accessibility for all. Besides, figures from the WBD suggest that the country increased the average years of education in 1.3 between 2000 and 2015, and that such attainment was evenly distributed among all income quintiles. In terms of educational programs, an important initiative is the scholarships program for higher studies in internationally recognised institutions all over the world with a register of 11.501 scholarships granted between 2007 and 2015 according to the National Secretary of Education, Science, Innovation and Technology (SENESCYT). There have also been projects involving the participation of foreign institutions and experts that allow for an important exchange of culture, knowledge and experiences, especially valuable in the labour market. Nevertheless, as numbers hardly provide the whole scenario, I was curious about how much we had improved in terms of thinking outside the box while choosing professions. I still wanted to scratch and look under the numbers of new enrolled in higher education and granted scholarships. Therefore, I started asking students, family and friends that have being part of the process about their experiences. Some of the questions include: “If you could choose anywhere to live, where would you go?” “If you could do anything you want for a living, what would you choose?” If you were given a wish to change your life, what would you ask for?” Clearly, the process was all but formal or well-designed so numbers loose importance. However, capturing how far it seems to people the achievement of their passions offers some insight on the situation. People thinking that emigrating would be their ticket to happiness; others studying business because that career was the only option with space left or, even worse, forgetting about their life plan in order to afford a living… it tells us that there is still much to be done. The trends exhibited in the Education Policy And Data Centre (EPDC) policy brief show that achieving the last 10% of educational coverage could take even longer than achieving the first of 90%. Also, those included in the remaining part generally involve people in rural areas, in generally excluded states or provinces, female, and the poor. This pattern is a call for attention as it suggests that policies in developing countries present systematic failures, which we have not complied with yet. New approaches are needed if we are about to give access to education and other relevant opportunities to the ‘remaining’ part of the population. New indicators must be included when evaluating the performance of social policy in terms of education. Growing figures of coverage are to be celebrated with no doubt, but quality of education and its actual impact on the population is still far to be achieved. Awareness of this limitation and our taking part with this responsibility would be a wise way to re-direct the journey. The article has no conclusions as it consists of an invitation for readers to contribute, from their experience and perspective. Do you agree with the approach taken to improve education in Ecuador? What has been your experience about the taken measures? What else could be done in order to build more reliable instruments to assess it? What should the public policy intend to drive in order to provide education with real use and impact? Your contribution matters, leave us a comment! First, this average is upwards biased since there is no information for 31 out of 44 countries considered in the region by the World Bank (WB), and the ones that present information are usually those with better results. Second, compared to the average for Europe and Central Asia (65%), while the highest values are similar, the averages differ by 20% as a result of the greater dispersion. 3. EPDC Policy Brief: What does history teach us in achieving Quality Education for All 2015? Este año se ha caracterizado por la certidumbre de la incertidumbre económica. El gobierno y otros actores relevantes han concentrado esfuerzos en identificar la extensión de la contracción economía, la pérdida de empleo y producción y ahora de los patrones de recuperación. Los indicadores señalan hacia una contracción económica que tiene ramificaciones hasta el mercado laboral. En términos macro, la contracción de la demanda interna, que a junio alcanzaba -7,4%, pone presión en las ventas y produce una desaceleración de la inflación a medida que los inventarios se acumulan: la inflación a octubre fue 1,3% mientras que en promedio de los últimos años estuvo en 3,8%. Fuente: Índice de Precios del Consumidor Instituto Nacional de Estadísticas y Censos y Cifras de Cuentas Nacional Trimestrales del Banco Central del Ecuador. La desaceleración de la inflación y su relación con los salarios nominales implica que los salarios reales se incrementan, restando competitividad al sector empresarial-productivo. La interacción entre estas variables deteriora las condiciones de empleabilidad en la medida que se expulsan trabajadores del sector formal. Ello se evidencia en las cifras de empleo. Hasta septiembre 2016 el empleo adecuado como proporción de la población económicamente activa se ha reducido de 47% a 39%, i.e. 333 mil trabajadores menos; y de igual forma las cifras de afiliados a la seguridad social ha disminuido en 163 mil trabajadores entre agosto 2015 y junio 2016. Fuente: Encuesta Nacional de Empleo, Desempleo y Subempleo-ENEMDU. Instituto Nacional de Estadísticas y Censos. Asimismo, a septiembre 2016 el ingreso real de los asalariados urbanos se ha contraído en 7,5% mientras que para el sector rural la caída ha sido de 6,2%. Pese a que el impacto en el salario rural es menor, es importante considerar que las estructuras laborales de las ambas áreas son bastante diferentes. La tasa de empleo inadecuado a nivel urbano es alta, 45% a septiembre, pero en el área rural llega a un inquietante 75%. Durante los años de expansión económica, la productividad y el salario real se divorciaron y caminaron de manera separada. La productividad, huérfana de quien la impulse, creció a una tasa promedio de 1,1% y 2,4% anual mientras que el salario real creció a una tasa de 4,8% anual de mano de la política salarial impulsada por el Gobierno. En términos acumulados el salario minimo real se incrementó en 48,5% mientras que distintas medidas de productividad crecieron en 9,9% y 22,4%. Nota: Cifras de productividad por perceptores de ingreso corresponde a ratio de PIB real para población cuyos ingresos son positivos y por horas trabajadas corresponde ratio de PIB real para suma de horas de trabajo principal, secundario y otro trabajo de la PEA. Fuente: Índice de Precios del Consumidor Instituto Nacional de Estadísticas y Censos y Cifras de Cuentas Nacionales Trimestrales del Banco Central del Ecuador. Es justamente este divorcio el que ha generado condiciones laborales tan precarias donde el 55% de la población a nivel nacional tiene un empleo inadecuado y donde el desempleado promedio del área rural lleva más de 3,5 meses en buscando trabajo mientras que el desempleado promedio urbano alcanza un perturbador 4,5 meses sin trabajo. El desafío para el periodo los años venideros, que debería estar en la agenda de los candidatos de elección popular, es crear un entorno educativo y tecnológico donde la productividad del trabajador pueda crecer. Estos entornos se crean de manera específica: i) atrayendo inversión productiva que tenga mejores prácticas manufactureras, ii) introduciendo tecnológicas en procesamiento agropecuario, iii) creando parques de innovación e investigación; y, a nivel más general fomentando la educación desde los niveles educativos primario y secundario, sin descuidar la formación superior no universitaria. En esta tarea tanto la participación privada como pública son necesarias e igual de importantes. De ello se desprende que una política laboral centrada en políticas salariales y de seguridad laboral puede resultar incompleta en el mejor de los casos y desacertada en el peor si no tiene como contrapartida políticas de productividad. Ecuador Económica 2012. Picture Window theme. Theme images by merrymoonmary. Powered by Blogger.